As in a whole pair. Two. More or less matching even, more or less knitted as charted. They're still not quite dry from the soak & block the other night and they fit on the big side, but considering it's a man's medium or a woman's large, hardly surprising. And now I can't decide which pair to knit next. Latvian? Another Selbuvotter? Convertible mittens? Gloves? I used not quite one skein of the yellow and a little more than a skein of the (and it's dark) blue of Jamieson's Shetland Sprindrift (25 grams/105 meters), size 2 dpn's. 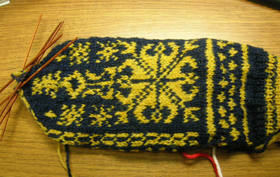 The pattern is from Terri Shea's Selbuvotter, Annemor #13. I changed the cuff pattern because I wasn't crazy about the original one. 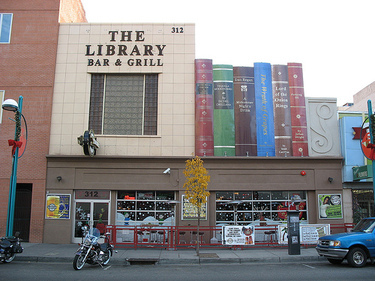 Is this bookstand not completely awesome? Chris sent it to me. And it actually works! It works with a large print hardback book (Children of Men, in case you're wondering) and endless stockinette best so far, but then there's that pesky learning curve. Oh, she sent me more goodies - two special CD's mixes - Coffee and Cat themed (it's enriching my iTunes - and Apple immensely, the ones I can find on it, mind you), a sheepie pez dispenser you have to see...which you can't yet, because naturally I don't the picture of it. I had a better picture of the stand too - I thought. It's not as precariously perched there as it looks. Actually, with my fabulous photographic skills, it looks like the book is suspended in mid air. Can you even see what's holding the book up? Under the yarn. Okay, better pix of it coming. But thank you, Chris! I love it. I'm pretty sure the yarn I'm knitting the scarf with, mrspao sent me on one of our unsanctioned coffee swaps. Speaking of better pix, is this not a fabulous picture? Snapped by Teofilo (and posted with permission from him), this is absolutely the bar I would have had, if I ever had one. 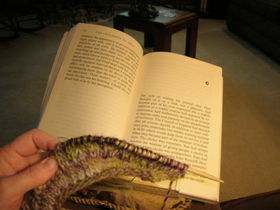 End of the year book and knitting update coming up. Remind me. NO CHALLENGES OR KALS OF ANY KIND, NO MATTER HOW TEMPTING. It's just the kiss of death for any projects and/or books I name. Why is that? If your life were a soundtrack, what would the music be? I Still haven't Found What I'm looking For - U-2. (I did NOT cheat! So cool). Hallelujah by Jeff Buckley. Oh, I could not have picked a song I'd like better. 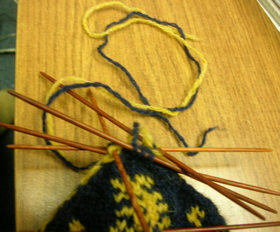 The Second Mitten! Huzzah! Doesn't it look innocent lying there? The deceptive thing. I had to redo it four mittens over. First, my normal inability to count messed up the chart set up pattern and now I'm working on my fourth try finishing it off. I think. I know I tried to do that "Loop The Live Stitches Through With A Crochet Hook" trick when I had something like.....fourteen live stitches left. Uh, too many. Rip back. Then I completely disregarded the pattern because at that point, easy! Who needs to look at a pattern? Yeah, easy to get the pattern completely wrong. Rip. Next I bound it off, in pattern, right amount of stitches.......except for those two stitches a few rows down gaily hanging out waving at each other. I have no idea how I can drop stitches and NOT NOTICE for rows and rows. No picture, darn it. I ripped it back (somewhat savagely) before I thought of taking one. 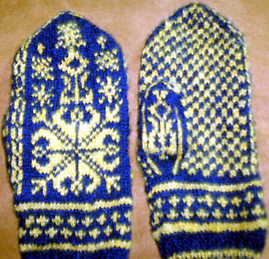 I'm trying not to think about how much I like the rounded mitten top better. And see? Whole, unharmed dpn's! So far. [darkly]. Not to mention, I was a wee bit worried about running out of yarn - I still have to knit the thumbs you know. Who WHO is following me around stealing my skeins? I don't buy single skeins. Ever. EVER. 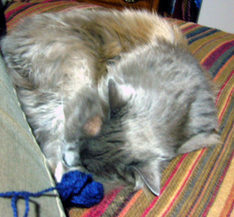 Hez sez: "I'm guarding this skein with my life. See? [zzzzzz]Don't be such a worrywart. There's more than enough here to finish the mitten and knit the two thumbs! [aside] If you have cat thumbs like me."